Applies To: TOAST.net customers wishing to configure an iPhone or iPad to receive email from a sub-account mailbox. Calendar and contact sync is not supported. Make sure your iPad/iPhone has an active Internet connection. Select the Settings icon, and then Mail,Contacts,Calendars from the list. 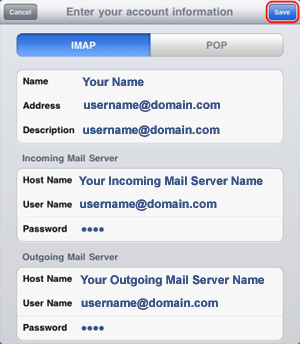 Once the settings are verified, you will be able to use the Mail app to check your email.